It might be time to join a few more wine clubs! The stylish Bin Short is the open-faced, compact offering in the Case & Crate line. 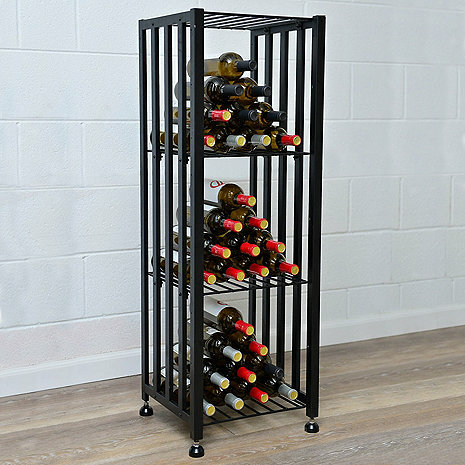 At just 3.5 feet in height, it can fit below Wall Series wall mounted wine racks or counters. Each Bin Short holds 48 bottles or more in cork-forward style. If you just need a high quality strong simple rack to toss some wine, this is a good choice. Very well built. The instructions require a slight bit of mental interpolation but it is not complicated or time consuming. They look good and are versatile for different wine bottle sizes. I tend to buy wine that is always in larger bottles and this has the flexible capacity to handle any variation. I would recommend it. It is not cheap but worth it if it fits your needs.